We just had to call our high-end bike the STORM, for those of you who are old enough to remember Derby Storm Skatepark will appreciate why we named it this. Derby Storm was where our BMX dreams and ambitions began, without this facility we may of not even started riding, and as a result probably wouldn’t be here today. This bike has it all and more with brand new 2.5 piece Social cranks, our aftermarket FREELOADER stem and the newly awaited BMX tyres from Kenda. 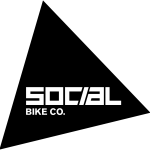 − Full chromoly Social tapered forks. − Full chromoly Social handle bar with smaller diameter cross bar, 8.5″ rise and 28.5″ width. − Social alloy hubs front and rear with 9T cassette driver, female axles and sealed bearings built onto Alienation Black Sheep double wall rear rims.